This year, the resurgence of violence by the Janjaweed militias in Darfur has displaced over 300,000 people. 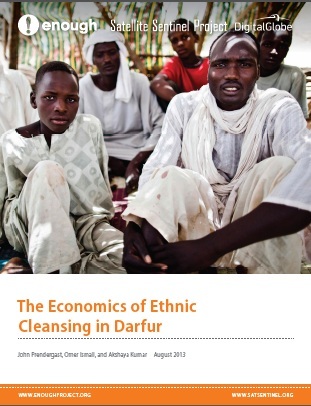 A new report by the Enough Project, “The Economics of Ethnic Cleansing in Darfur,” examines the patterns of recent violence and confirms the Sudanese government’s economic and security incentives for sponsoring violence and instability in Darfur. The expansion of violence to Arab tribes historically aligned with the government accounts for the characterization of “inter-tribal” hatreds fueling the conflict. Currently, the government in Khartoum controls this narrative, citing inevitable “inter-tribal” hatreds as the root cause of violence throughout the region. The Enough Project report counters this, citing the economic incentives for the Sudanese government to systematically create and maintain instability in Darfur. By playing regional groups off of each other, the government can capitalize on the lucrative resources throughout the region. These looting and extortion schemes also protect the government from Janjaweed discontent and retaliation, shifting the burden to fulfill the Janjaweed’s demand for payment onto the Darfuri population. Now, clashes between tribes regularly occur around the gold mines in North Darfur, gum arabic groves in South Darfur, and fertile lands of Central Darfur. The purpose of these clashes can be categorized into two types: land grabbing and money-making schemes to pacify Janjaweed militiamen. Working as proxies of the government, these militias are responsible for the burning of sixteen villages in Central Darfur, razing homes and destroying water pumps, and prohibiting the residents to return. Central Darfur serves as a clear example of the tactics and events happening throughout the resource-rich areas of Darfur, where financial gains are most immediately secured through violence. By systematically expelling populations and destroying towns with lucrative resources – gold, gum arabic, and fertile land –government-aligned militias harness control over the resources to occupy and distribute as they please. Darfur once again needs international attention. This time, international actors need to acknowledge the failures of previous attempts for peace and stability in Darfur, and expand the efforts to address all of the contributing factors to violence. Previous efforts dealt with the conflicts within Darfur in isolation from each other, and considered Darfur separately from conflicts throughout the country, which further entrenches the divide-and-conquer strategy utilized by the Sudanese government to maintain control. To combat this alienation, the Enough Project calls for a comprehensive and holistic approach towards peace in Sudan, highlighting initiatives to address economic drivers of conflict and hold criminals such as Ali Kosheib accountable. The Enough Project calls for the AUHIP, U.N. Envoy Haile Menkerios, and soon-to-be-announced U.S. Special Envoy to push for a new comprehensive, internationally-backed peace process which does not segment the conflicts in Sudan, but addresses them holistically, and includes greater engagement with armed and unarmed opposition in Sudan.